Boudica’s revolt provokes an abstract narrative figuring in, and figured by the landscape of the Boudicca Way [sic.] in South Norfolk and beyond: the set for a filmed journey documenting battle-worthy performances. 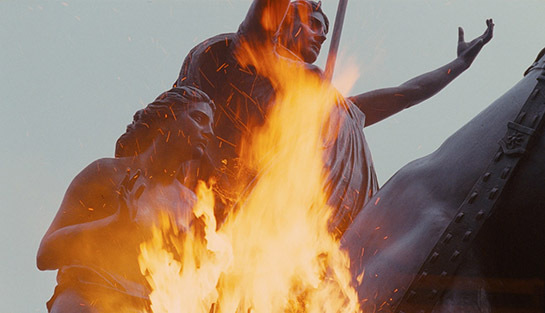 Her name, with its many spellings – Boudica, Boadicea, Boudicca, Buddug – invokes a sense of layered histories, circling facts of debatable authority in the telling and re-telling of her tale, a symbol revisited across space and time. The landscape is visited as a geographical palimpsest, a space to excavate via the imagination, but also to project re-imaginings of past events as fragmented and theatrical moments via performance, painting and sculpture. Jessica Warboys (b. Newport, 1977) studied BA Fine Art at Falmouth and MFA Sculpture at the Slade, London. Recent solo exhibitions include AV Festival, Laing Gallery, Newcastle; Spike Island, Bristol; and Gaudel de Stampa, Paris. She was included in documenta 13, Kassel; selected for Artists’ Film International, Whitechapel Gallery, London; and has shown in group exhibitions in Brussels, Milan, Rome, Paris and elsewhere. She was shortlisted for the Jarman Award in 2013. She lives and works in Suffolk and Berlin. Morten Norbye Halvorsen (b. Stavanger, 1980) has exhibited widely, including solo shows at Objectif Exhibitions, Antwerp; the Lithuania/Cyprus Pavilion, 55th Venice Biennale (which received a Special Mention for National Participations); the Mindaugas Triennial, Contemporary Arts Centre, Vilnius; and in group exhibitions at the Centre Pompidou, Fondation d’entreprise Ricard and Palais de Tokyo, Paris; REDCAT, Los Angeles, Artists Space, New York; and elsewhere. He forms, with artists Chris Evans and Benjamin Seror, the band Concert, which released a 10” LP ‘Behave Like an Audience’ last year with Sternberg Press. Halvorsen has worked with Jessica Warboys on several films and performances. A Promontories commission in partnership with OUTPOST.